LINQ (Language Integrated Query) is a Microsoft .NET Framework extension component that adds native data querying capabilities to .NET C# and Visual Basic programming languages using a native syntax reminiscent of SQL, and provides class libraries to take advantage of these capabilities. LINQ defines a set of query operators that can be used to query, set, transform, project and filter data in arrays, enumerable classes, XML, relational database, and third party data sources. LINQ was officially released as a part of .NET Framework 3.5 on November 19, 2007. 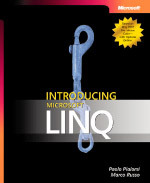 For anyone who wants to learn and master LINQ technology, Microsoft Press, the publishing arm of Microsoft, has published Introducing Microsoft LINQ, written by Paolo Pialorsi and Marco Russo (ISBN: 9780735623910). As part of Visual Studio 2008 Free E-Book Offer, full complete book of Introducing Microsoft LINQ is available for free download without payment or credit card required in digital PDF format. Everyone can sign up to receive the free e-book offer at by libredigital.com, or go direct straight to the Introducing Microsoft LINQ PDF e-book download or view chapter page here. Windows Live ID sign in is required. Other than full complete book of Introducing Microsoft LINQ on offer for free download, partial contents with selected chapters for Introducing Microsoft ASP.NET AJAX by Dino Esposito (ISBN: 9780735624139) and Introducing Microsoft Silverlight 1.0 by Laurence Moroney (ISBN: 9780735625396) is also available for free download.